Hairy cell leukemia is a type of cancer in which the bone marrow makes too many lymphocytes (a type of white blood cell). Hairy cell leukemia is a cancer of the blood and bone marrow. This rare type of leukemia gets worse slowly or does not get worse at all. The disease is called hairy cell leukemia because the leukemia cells look "hairy" when viewed under a microscope. In hairy cell leukemia, too many blood stem cells become lymphocytes. 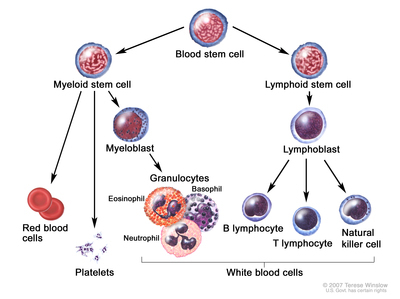 These lymphocytes are abnormal and do not become healthy white blood cells. They are also called leukemia cells. 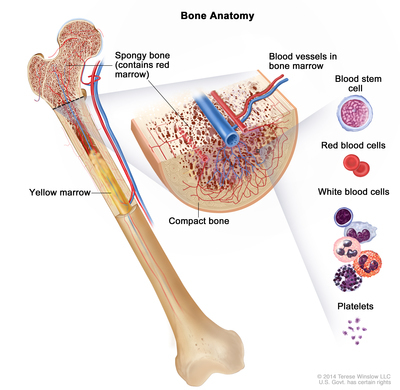 The leukemia cells can build up in the blood and bone marrow so there is less room for healthy white blood cells, red blood cells, and platelets. This may cause infection, anemia, and easy bleeding. Some of the leukemia cells may collect in the spleen and cause it to swell. Gender and age may affect the risk of hairy cell leukemia. Anything that increases your chance of getting a disease is called a risk factor. Having a risk factor does not mean that you will get cancer; not having risk factors doesn’t mean that you will not get cancer. Talk with your doctor if you think you may be at risk. The cause of hairy cell leukemia is unknown. It occurs more often in older men. Signs and symptoms of hairy cell leukemia include infections, tiredness, and pain below the ribs. 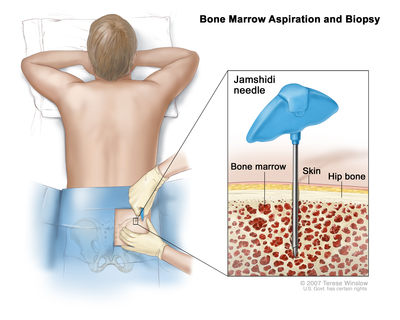 Tests that examine the blood and bone marrow are used to detect (find) and diagnose hairy cell leukemia. Physical exam and history: An exam of the body to check general signs of health, including checking for signs of disease, such as a swollen spleen, lumps, or anything else that seems unusual. A history of the patient’s health habits and past illnesses and treatments will also be taken. 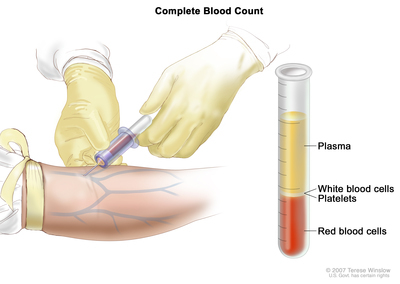 Peripheral blood smear: A procedure in which a sample of blood is checked for cells that look "hairy," the number and kinds of white blood cells, the number of platelets, and changes in the shape of blood cells. Immunophenotyping: A laboratory test in which the antigens or markers on the surface of a blood or bone marrow cell are checked to see what type of cell it is. This test is done to diagnose the specific type of leukemia by comparing the cancer cells to normal cells of the immune system. Gene mutation test: A laboratory test done on a bone marrow or blood sample to check for mutations in the BRAF gene. A BRAF gene mutation is often found in patients with hairy cell leukemia. CT scan (CAT scan): A procedure that makes a series of detailed pictures of areas inside the body, taken from different angles. The pictures are made by a computer linked to an x-ray machine. A dye may be injected into a vein or swallowed to help the organs or tissues show up more clearly. This procedure is also called computed tomography, computerized tomography, or computerized axial tomography. A CT scan of the abdomen may be done to check for swollen lymph nodes or a swollen spleen. The number of hairy (leukemia) cells and healthy blood cells in the blood and bone marrow. Whether the spleen is swollen. Whether there are signs or symptoms of leukemia, such as infection. Whether the leukemia has recurred (come back) after previous treatment. Whether the hairy cell leukemia does not grow or grows so slowly it does not need treatment. Whether the hairy cell leukemia responds to treatment. Treatment often results in a long-lasting remission (a period during which some or all of the signs and symptoms of the leukemia are gone). If the leukemia returns after it has been in remission, retreatment often causes another remission.